In a large bowl, sift together the flour, cocoa powder, baking powder and salt, and set aside. Using a handheld electric mixer, beat the shortening, butter and sugar into a cream. With the mixer on low, add the anise, cinnamon and egg yolks. Beat until creamy. Add the orange zest and juice. Lower the mixer speed and gradually beat the mixture. Fold in the finely ground pecans, cover with plastic wrap and chill for 1 hour. Preheat oven to 350 °F. Line three baking sheets with parchment paper and set aside. Divide the dough into three equal parts. On a lightly floured surface, roll out the dough and, using a 2-inch star-shaped cookie cutter, make 12 cookies. Transfer to a lined baking sheet. 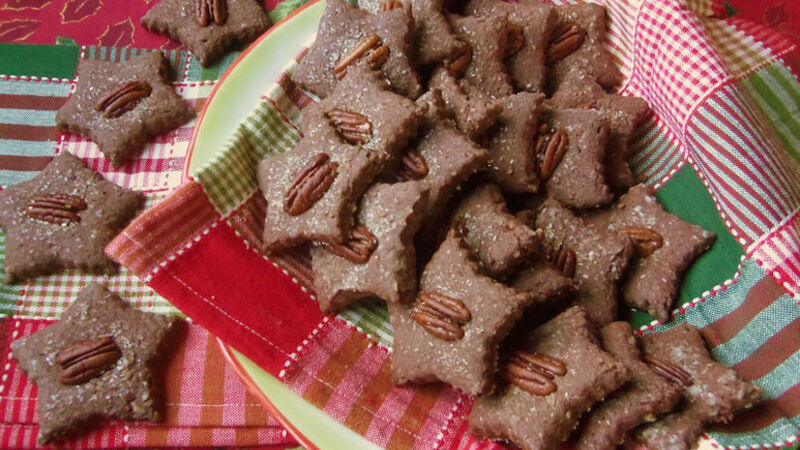 Top each cookie with half a pecan and sprinkle with the raw or brown sugar. Repeat until all cookies are done. Bake for 11 to 14 minutes, rotating the baking sheets halfway through the cooking time. Remove from the oven and let cool before removing from the baking sheets. Cool completely before storing in an airtight container. You can prepare the cookie dough 10 days ahead of time and store it in your freezer. Defrost in your refrigerator two days before baking. One of my favorite baking recipes for the holidays is Mexican-style hojarascas. In fact, one of my most cherished memories is the care packages I would receive from my mom during the holidays filled with freshly baked hojarascas. These traditional Mexican cookies include anise and cinnamon. Pecans add an extra crunch to the recipe, but I went a step further and added some rich cocoa powder to give it some added flavor and sweetness.